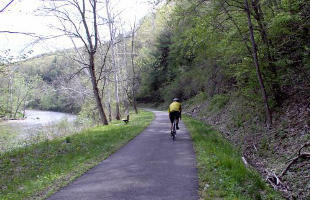 The scenic 9.7 mile asphalt trail is built on a historic railroad grade which runs parallel to Oil Creek through wooded park land. The trail is suitable for users of every level of conditioning. Creek vistas, restrooms, and picnic areas are strategically located along the trail. This trail offers a special combination of natural beauty and historical significance. The trail follows the path of development of the oil industry in the 1860's. The story is told by the museum, a replica of the first oil well (Drake Well), walking tours and programs, relics of the early industry, and interpretive signs along the trail. Other park features include: The Oil Creek and Titusville Excursion Railroad (www.octrr.org); 15 miles of cross country ski trails; canoeing on Oil Creek (no rental); 36 miles of marked hiking trails with overnight camping shelters; and outstanding fly fishing. Trailheads and parking are at the Drake Well Museum near Titusville and the park office location in Petroleum Center near Oil City. Both have access roads that connect to PA Route 8. The museum entrance, off Route 8, is on the southern edge of Titusville at E. Bloss Street near the Jersey Bridge. Or follow the access road 3 miles to Petroleum Center. The trail was extended into downtown Titusville in 2003. It ends at the intersection with Route 8 behind McDonalds. The trail is difficult to find at this end, but it runs between the new Titusville Middle School and Oil Creek and then behind the Recreational Complex.